The view of Bay Ridge Channel from Sunset Park. All photos by Kelsey Burrow. 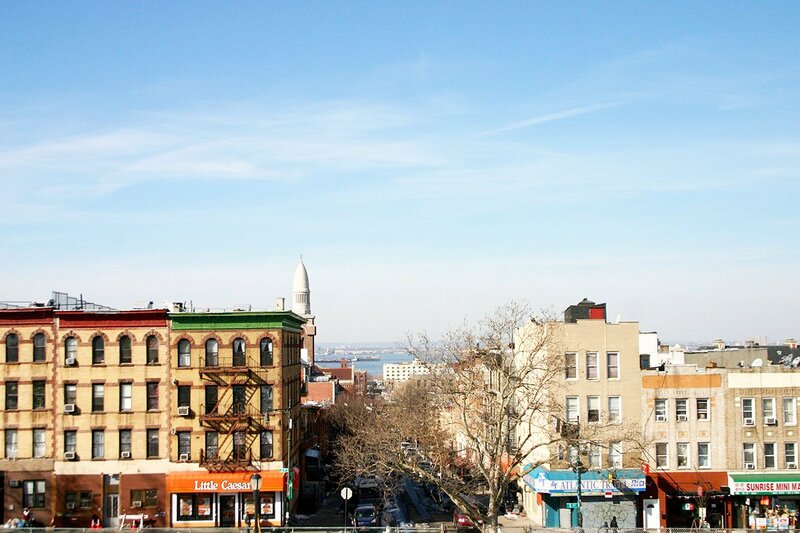 There's more to Sunset Park than taquerias and panaderias (but make time for those too). Writer and recent transplant Kelsey Burrow takes us on a Saturday tour of Brooklyn's immigrant-artist-industrial neighborhood. SUNSET PARK, Brooklyn — When I considered moving south to Sunset Park from Park Slope about eight months ago, the reaction was typically, "Oh cool. Great tacos." And honestly, that was all the convincing I needed. (Affordable rent wasn't so bad either.) But I've found Sunset Park has even more to offer than its transcendent taquerias and panaderias. There's a beautiful co-existence of tradition and culture on every avenue — Latino on 5th, Chinatown on 8th, Jewish on 9th — meshed with the scrappy entrepreneurial spirit that's steadily rising from new coffee shops, green spaces, and the Industry City warehouse complex that houses a small-batch experimental distillery, growing start-ups and, this winter, the beloved weekend markets Brooklyn Flea and Smorgasburg. Even the Brooklyn Nets know what's up: The team's brand-new 70,000-square-foot training facility occupies the eighth and ninth floors of a century-old warehouse building at the waterfront on 39th Street. Sure, it's not the most convenient neighborhood to get to, but can I convince you with two words? Express. Train. Plus, you'll forget all about the commute when the view of Manhattan from atop Sunset Park takes your breath away. And that tray of al pastor tacos might leave you breathless too. The best way to get to know the neighborhood is to stop by for the day. Here's a perfect one. 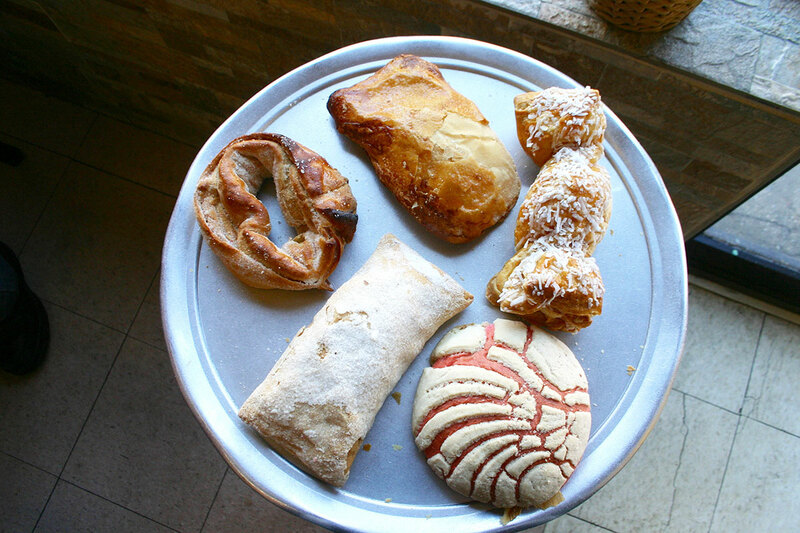 A selection of traditional Mexican pastries made fresh daily at Don Paco Lopez Panaderia. 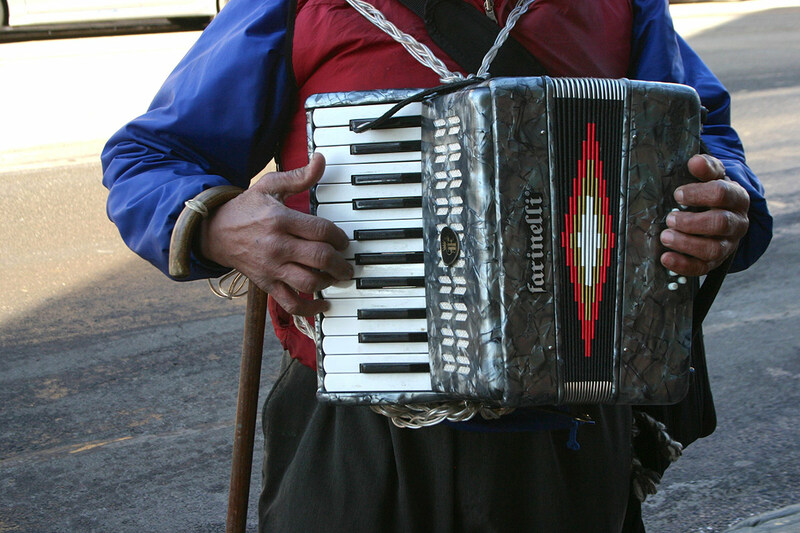 A street performer plays the accordion on 5th Avenue. Though tempting, skip the steaming coolers of tamale street vendors and instead have breakfast at family-owned Don Paco Lopez Panaderia for a taste of old-school Sunset Park. The ceramic sign above the bakery counter notes 1933, the year the owner's father began teaching him to make bread in Mexico. Pastry cases line a wall filled with the stuff of dreams. Every pastry is oversized and covered in sugar, honey, or coconut. Some are neon pink. Confession: Mexican pastries just aren't my thing. As my husband put it, they all kind of taste like tortilla chips, but the best of the bunch looked like a sugar-covered Hot Pocket and was filled with rice pudding. Get that. 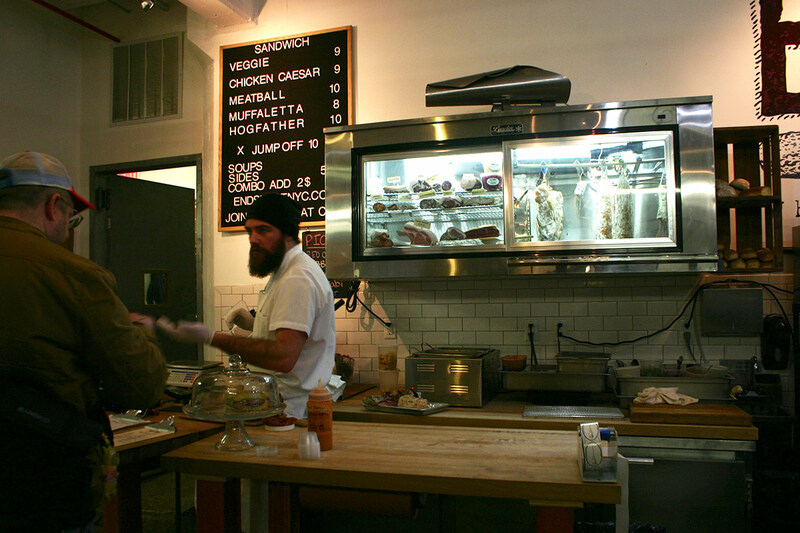 A back hallway from the bakery leads to the restaurant side where there are two tables, a narrow stool-lined bar, and a line of people. Here's a little beverage terminology that you'll need: Champurrado is like a savory hot cocoa: an atole, or a thick drink of corn dough or flour, mixed with Mexican chocolate. Arroz con leche is a sweeter choice: a warm mix of traditional rice pudding and milk. Ask for samples; it's not frowned upon. Then choose between a torta or husk-wrapped tamale. I went with mole pork and salsa verde. There's also a dulce option filled with sugar and prunes if you're into that. 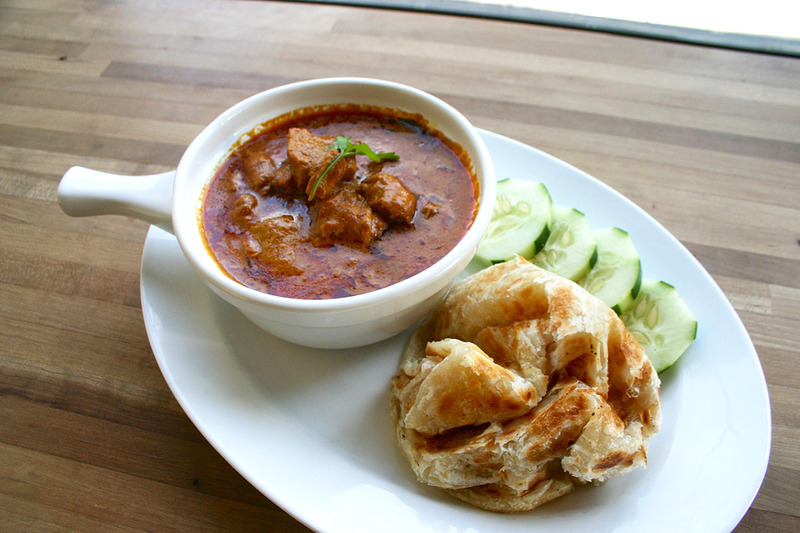 The owner and chef behind Parlay uses his mom's family curry recipe and serves the cafe's signature Mum's Malaysian Chicken Curry with warm roti. 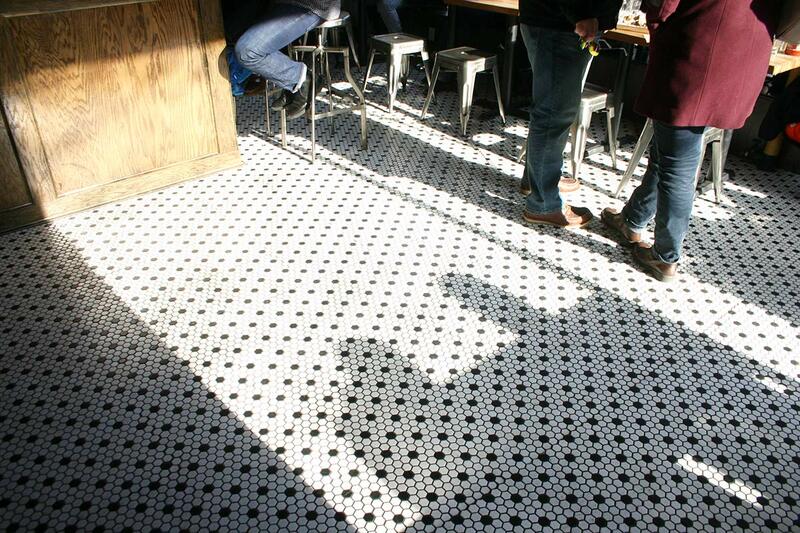 Parlay buzzes with brunch crowds on a sunny Saturday afternoon. A sure sign of an emerging neighborhood is a third-wave coffee shop. Or in our case, three. Sun House is the newest to the block, opened just weeks ago right off the park at 41st and 7th Avenue, serving Brooklyn's own Parlor Coffee. Parlay, just one block up on 8th Avenue, is better known for its cool ambience and food like hand-cut fries with Sriracha mayo and Mum's Malaysian Chicken Curry — the owner's family recipe — served with warm roti. But my go-to before a walk through the park is Parkette for its good vibes, good people, and good coffee. Four friends and Sunset Park locals who recognized the void opened the cafe in mid-November, offering Stumptown coffee, Colson pastries, and Dough doughnuts (weekends only) to the neighbors. When you stop in, ask for baristas Jeremy or Jhon, longtime friends who grew up in Sunset Park. Tell them Fathom sent you, and see where they point you next. Get your coffee to go and head to the epicenter and namesake of the neighborhood, Sunset Park, between 5th and 7th Avenues, from 41st to 44th Streets. Don't turn around till you get to the benches at the top, then sit a while, taking in the skyline view. Definitely take a lap or two for optimal people watching. This is, after all, where every culture and every avenue comes together. The 478-acre National Historic Landmark Green-Wood Cemetery offers stunning city views as well as an urban oasis of hills and valleys, glacial ponds and paths throughout 19th- and 20th-century statuary and mausoleums. 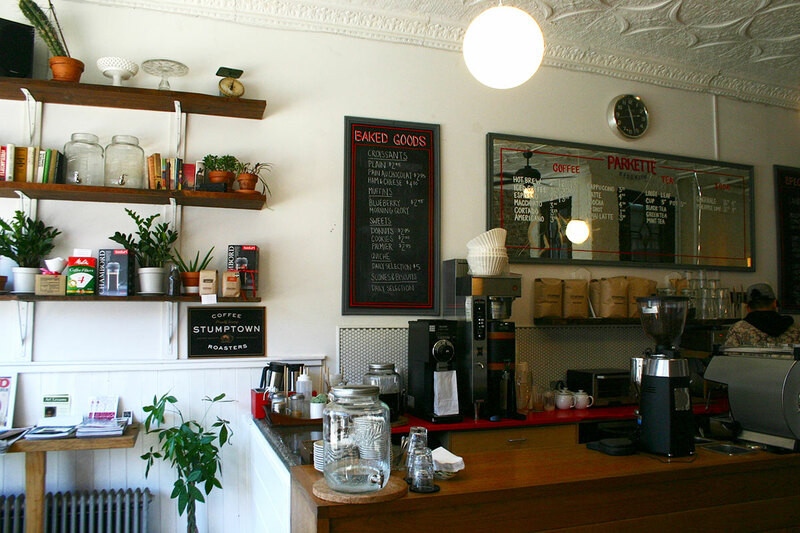 Parkette, a new coffee shop on 5th Avenue in the heart of Sunset Park, marks a shift trickling through the neighborhood. 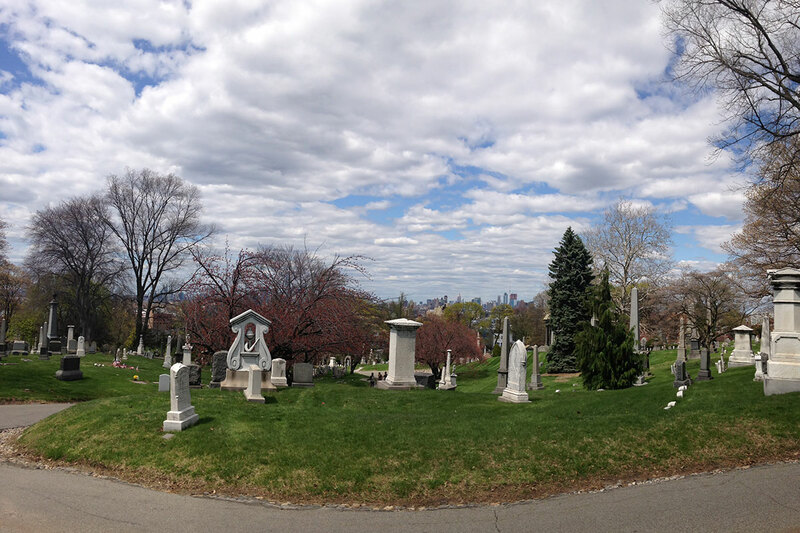 Another green space of note is the historic 478-acre Green-Wood Cemetery(entrance at 5th Avenue and 25th). Established in 1838, Green-Wood was one of the largest tourist attractions in America in the 19th century, second only to the Niagara Falls. If heading to Green-Wood, first follow your nose to Baked in Brooklyn right at the entrance for picnic essentials: baguette, cheese, and chocolate-glazed donuts. For lunch, it's either the legendary Tacos El Bronco (5th Avenue and 37th) truck or Taqueria El Mezcal (3910 4th Ave.; +1-718-768-2846), a humble lime green storefront at 4th Avenue and 39th. (The latter may also be listed as Taqueria El Maguey.) Get both to taste test and decide for yourself. Prices at both are cheap, but calm, warmth, and vegetarian options await at El Mezcal. Feeling even more divey than a taco truck? The tiny Mexican cafe counter in the back of a bodega called 4011 Deli & Grocery (4011 5th Ave.; +1-718-972-1578) serves quesadillas, tamales, and the like, plus an impressive roster of weekend specials like the sopa de mariscos. For a snack break try a smoothie at kitschy and colorful Don Pepe Tortas & Jugos. I opt for the greens and ginger (mango, peaches, lemon, ginger, kale, spinach), but a crowd-pleaser is American pie (green apple, banana, spinach, coconut water, cinnamon, and nutmeg). 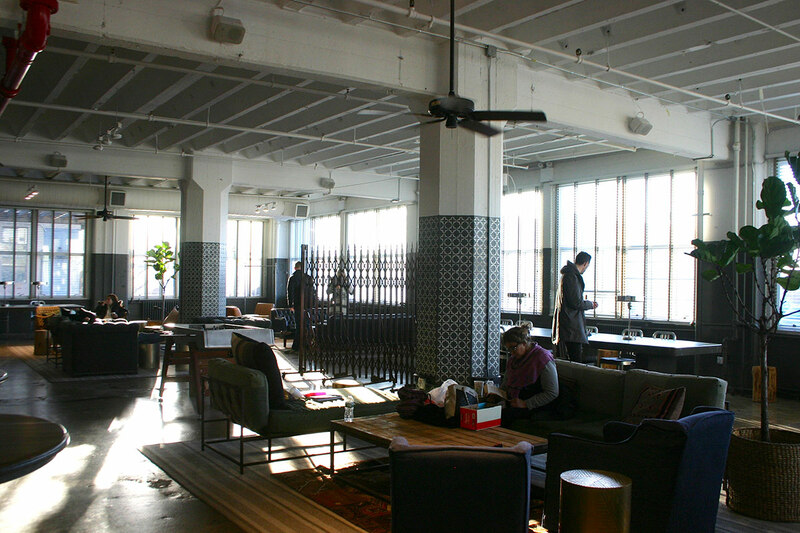 The Landing, a brand-new restaurant, event space and communal gathering place, offers Industry City goers a retreat. Ends Meat owner John Ratliff gives sample after sample of his salumi to visitors of his Industry City shop. Still unknown to most locals, the waterfront Bush Terminal Park opened in 2014 and has some of the best views of the city and Bay Ridge Channel from its esplanade, as well as astro-turf soccer and baseball fields, a running loop, and a pier. Enter at 43rd Street off 1st Avenue through an entrance that stands out amid the dilapidated industrial surroundings. Though the once-bustling shipping docks of Bush Terminal remain abandoned, Industry City buzzes again with new life through a warehouse complex of 19 buildings sprawled across cobblestone streets on the Gowanus Bay. The first floor of Building 3 (entrance on 36th Street) houses a food hall with shops like Ends Meat whole-animal salumeria (spicy cacciatorini or sopressata, please) and beloved confectionary Liddabit Sweets, plus the baking commissaries of One Girl Cookies and Colson Patisserie. Follow the hall to WantedDesign for housewares, jewelry, and books, as well as the behemoth restaurant and event space called The Landing. It's almost too big, though it's perfect for families who need space, first daters who need a pool table, and bookish introverts like me who need a quiet corner with a view. For a nightcap, head to Industry City Distillery's Tasting Room in Building 5 (enter on 35th Street and head up to the 6th floor). Tours begin at 3 p.m. on Saturdays (reserve ahead), and the tasting room is open from 4 to 10 p.m. every Friday and Saturday night. One of the OG tenants of the new creative set here in Industry City, ICD opened in 2011 with the goal of "making delicious vodka that makes sense in Brooklyn," according to chief distiller and machinist Zac Bruner. That means they forego ye distilling ways of olde because they're just not sustainable in the city. I.e., they use beet sugar instead of the standard grain or potatoes in order to cut down on waste. (You're welcome, Jersey.) Zac builds all the distilling equipment they use to make their two products, Industry Standard Vodka and Technical Reserve, a high-proof, totally neutral spirit crafted specifically for the creative mixologist (or perfumer, or amateur scientist...). The 6th floor corner tasting room is flanked by windows on either side, so take your limoncello or hop-infused cocktail to the window seats to watch the city sparkle, a world away from your perch in Sunset Park. SUBWAY/BUS: Take the D, N, or R trains to 36th Street if you're starting at Industry City, or take the R local one more stop to 45th if you prefer to start with a tamale at Don Paco Lopez like me. You can also take the B63 from Brooklyn Heights or Park Slope straight down 5th Avenue into Sunset Park.